In October 1975, my baby sister Bonnie Blue was born. Baby girl had curly white-blond hair, a round cherub face and bright blue eyes. Bonnie Blue looked like an adorable Gerber Baby . . . drool and all. As the big sister, it was my job to babysit Bonnie when my parents were away. I didn’t really mind and by the time she turned 2, I would often carry her to the park near our house. 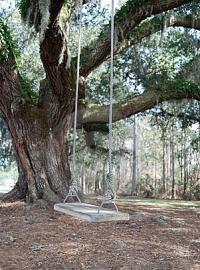 The park had many fascinations; an ancient oak tree for climbing, swings and slides to entertain little sister, and most of all Frampton. Yes, at the age of 14, I had discovered boys and Frampton was the first object of my affection. Frampton had long wavy red hair, kind of like an Irish setter, and chocolate brown eyes. He was trying to grow a mustache. However, the hairs had only grown on the sides of his mouth and not under his nose. My father, Honest Joe had decreed that I was not allowed to date until I turned 15. Nobody went against Honest Joe. So, in a moment of brilliance, I decided to call Frampton "Mickey Mouse" whenever baby sister was around. At dinner time, the conversation would often go like this . . . Dad would ask Bonnie "Did you go anywhere today?" Baby girl would reply “The park.” Dad would ask “Did you talk to anyone?” Bonnie would say “Mickey Mouse.” Honest Joe would then say “That’s nice” and I would be able to breathe again. Bonnie then told me that she had gone through her entire life thinking that when she was a child, she once had an imaginary friend named Mickey Mouse. I really am sorry that I confused my little sister. But, I still can’t help smiling whenever I remember that time . . .